...I'm pleased to announce that #1, Cynthia, is the winner! 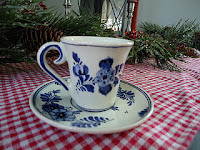 Please email me (sew18thcentury@gmail.com) your mailing address to receive the teacup. Happy holidays and thanks for the lovely comments!